Healthy Acadia is excited to sponsor the annual Wild Blueberry 5-Mile Run/Walk and 1-Mile Fun Run/Walk! The 5-mile race/walk begins promptly at 8:00 a.m., the 1-mile events begins at 8:15 a.m. Pre-registration online is encouraged. Teams MUST pre-register by 4pm on August 15th! In person Pre-registration and Race Packet Pickup will be on ONE DAY ONLY: Friday, August 17th, from 7:00 AM to 9:00AM, and from 3:00PM-7:00PM, at the Hemingway Annex, 118 Court Street, Machias. The Wild Blueberry Run is the kick-off to the annual Machias Wild Blueberry Festival, which features hundreds of craft vendors, exhibits, activities, and great foo d! Healthy Acadia has partnered with Brian Hubbell’s electronic timing system, a professional race management company based in Bar Harbor, Maine, for the event. The 5-mile loop is hilly and scenic, with mile splits at 1 and 3, with a fast downhill finish with many cheering spectators! Water at miles 2, 4, and the finish. Proceeds will directly benefit the Healthy Acadia and our partner the Beth C. Wright Cancer Resource Center Cancer Patient Navigator Program. This service provides caring, effective support for individuals facing cancer—helping them on their cancer journey to access treatment and resources. Additional donations are appreciated. All donations are tax-deductible. Please make checks payable to Healthy Acadia Mail to: Blueberry Run, Healthy Acadia 121 Court Street, Suite A, Machias, ME 04654. Start your Saturday morning of the Festival with a bang … the bang of the gun starting the race! 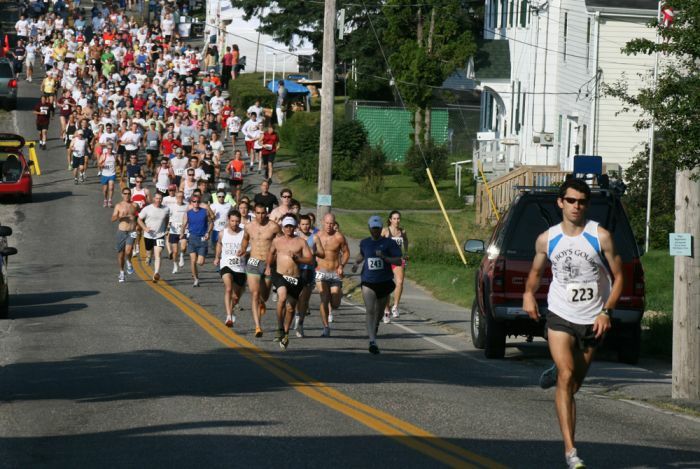 More than 300 runners compete in the 5 mile road race through the streets of Machias and Marshfield. Do you have what it takes to aim for your personal best? If so, join us for this popular event! The Annual Blueberry 5 Mile road race will start at the 118 Court Street, the Hemmingway Annex (the old Machias Town Office), on Saturday, August 18, 2018, promptly at 8:00AM. Awards for 5-Mile Run: Top 3 female & male overall. Top female & male ages: 14 & under, 15-24, 25-40, 41-55, 56-70, & 71 & older. Start your Saturday morning with a 5-Mile walk around the beautiful town of Machias and Marshfield.and enjoy the views of beautiful Down East Maine. The Walk will start at the 118 Court Street, the Hemmingway Annex (the old Machias Town Office), on Saturday, August 18, 2018, promptly at 8:00AM. Not to be outdone, the kids have all the glory following the adult race with their own 1-mile fun run around the streets of Machias. Don’t miss the excitement and the chance to cheer on the young ones and a few young at heart in their quest to cross the finish line! Baby Strollers are allowed on the 1 mile course, please start in the back. The Walk will start at the 118 Court Street, the Hemmingway Annex (the old Machias Town Office), on Saturday, August 18, 2018, promptly at 8:15AM. An unlimited number of runners/walkers may register as a team. But, remember, teams MUST pre-register by 4pm on August 15th! Team Awards: 1st & 2nd teams. Top 3 score by place of finish. Ties are determined by fastest cumulative times. Awards for all events will be presented directly following the race at the Hemmingway Annex on Court Street. 5-mile course: $25.00, or $30.00 on the day of the event. 1-Mile course: $10.00, or $15.00 on the day of the event. Registration fees for all events are non-refundable! Download and Print Registration Form here. Pre-Register by August 10, 2018 to reserve your exact “Wild Blueberry Run” T-Shirt size! Without pre-registration, we can not guarantee T-shirts sizes handed out the day of the event. By phone: (207)-255-3741 or (207)-263-6230. FOR INSURANCE AND SAFETY REQUIREMENTS, NO HEADPHONES or PETS ALLOWED ON THE RACE COURSE FOR EITHER RACE.